POSEIDONIA HOTEL APARTMENTS include 113 apartments; big, comfortable with open spaces and sun light from end to end; some of them have a wonderful view to the sea, some a view to the swimming pool, while others are surrounded by the deep green of the trees, which are spread all along the mountainside. All the apartments have an aesthetic temperate decoration and the natural wooden decor raises upon them an air of nobility. 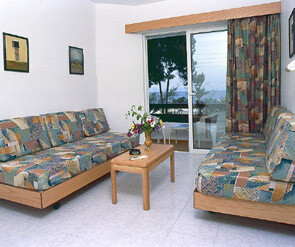 Each apartment consists of one bedroom, living room, kitchen and a comfortable bathroom, providing also television, radio, and telephone and air-conditioning facilities. The balcony with the nice view is an excellent place for both breakfast and dinner. 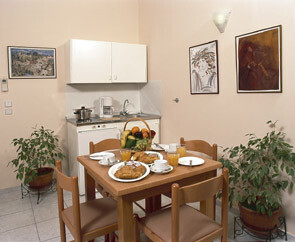 The fully equipped kitchen serves every of your needs at any minute of the day.